Render this image in العربية (ar) Deutsch (de) English (en) español (es) français (fr) हिन्दी (hi) italiano (it) Nederlands (nl) português (pt) русский (ru) Türkçe (tr) اردو (ur) . English: International Symbol for Marriage. Español: Simbolo internacional para matrimonio. Français: Symbole international pour le mariage. Italiano: Simbolo internazionale del matrimonio. Deutsch: Internationales Symbol für Heirat. To embed this file in your language (if available) use the lang parameter with the appropriate language code, e.g. [[File:International Symbol for Marriage.svg|lang=en]] for the English version. 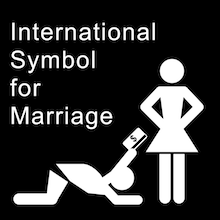 International Symbol for Marriage: She rules - He pays!